I love any kind of whole grains. Ragi is not an exceptional. Starting from my childhood to till now, I am using it frequently. I thought of using the ragi in western dishes and searched in web as a first step. Got this recipe from Sanjeetha's place and prepared it immediately without altering anything as it was my first try with whole grains in baking. Visit her place if you need more yummy and healthy bites. The ragi cookies were very good on the healthy side. 1) Dry roast the ragi flour for few minutes till the raw smell disappears. Use wide pan to do this. Try to avoid using chimney for this step. 3) Mix all the ingredients well and keep it aside. 4) Now go ahead and mix the wet ingredients. Use another wide pan to do this. 5) Add melted butter,sugar and then curd to the bowl. 6) Mix it well it sugar dissolves. I got something dark as shown in the picture. 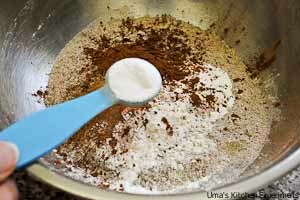 7) Now, slowly add wet ingredients to the dry ingredients and make a smooth dough. 8) Preheat the oven to 190°C / 375°F and line the baking tray with baking sheet. 10) Sprinkle few chocolate chips on top of it. 11) Bake it for 10-15 minutes or till the cookies slightly change in colour. It took 12 minutes for me. 12) Once done, transfer the cookies to a wire rack and cool completely. 13) Serve with hot tea or coffee. 1) I added cinnamon powder as my family is great fan of it. If you have not used it much before, give a try starting with low quantity. It might sometimes give strong flavour. Or use cardamom powder as sanjeetha mentioned. 2) Try to use chocolate chips which is only for baking to avoid melting during the baking time. 3) I used Ghee instead of butter as I didn't have butter at my pantry when I prepared this cookies. It was totally yumm. Linking this event to the event, Priya's Fast Food is NOT Fat Food event which is going on here. 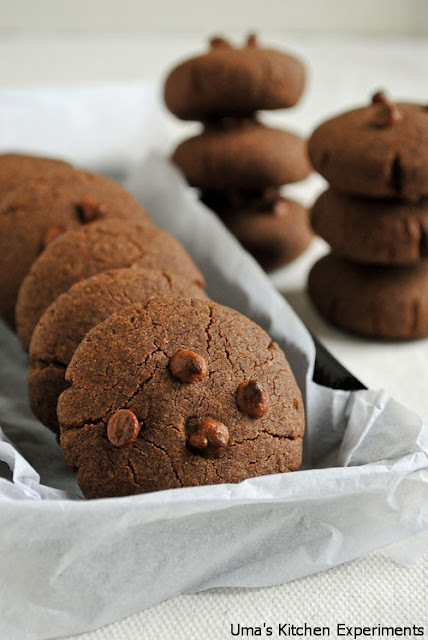 Ragi cookies look tempting Uma. Ragi is quite versatile. These cookies look yum. I have posted a ragi, carrot and sweet potato cake without any maida in it. It makes a nice ingredient for western bakes. Very delicious n yummy bake,never thought to use ragi flour..lovely biscuits!! Looks so good,tasty and healthy cookies. 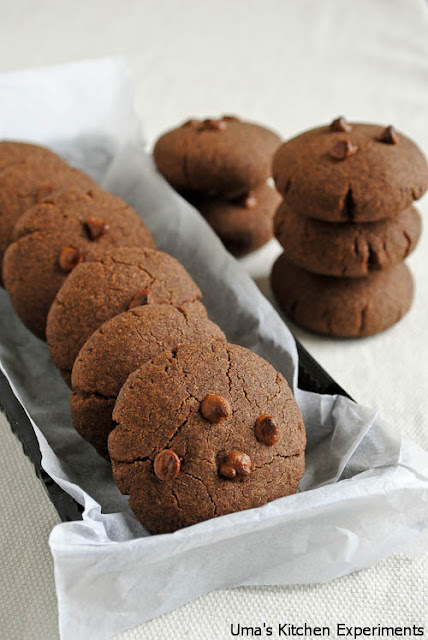 I too planning to make some Ragi cookies from Priya's blog for BM :) n this ragi cookies sounds so great n yummy...perfectly done!! Very healthy and crunchy cookies. I started using ragi recently for my dinner.Next will be baked goods. Tempted ! Healthy and delicious looking cookies. Wow..cookies luking so perfect..Healthy version too. So healthy and looks so chocolatey coz of ragi's color! Yumm!! The cookies look amazingly good..so wholesome as well. Would try these out soon. Pretty pictures as ever. I tried this recipe yesterday. I didnt have cornflour so I used custard powder. My cookies turned out to be melt in the mouth types, but they didn't hold very well. I don't know what i did wrong. Maybe I patted them too thin? Any tips u can give me? 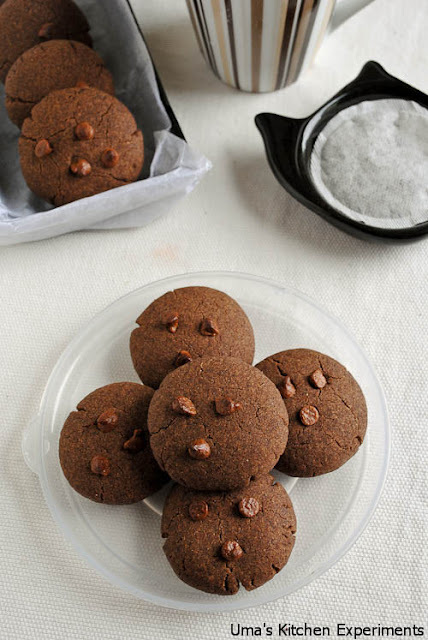 I now want to try ragi cookies with jam topping! We hate ragi otherwise and i have about 1kg to use. I am going to try all variations. Thanks for trying Richa. You can reduce baking time in that case. They are very brittle in my case too when I baked first time. so I reduced baking time (at the same time, cookies has to be done). The baking time varies based on the oven brand, it might differs. Also, they won't melt too much while baking. so make/shape cookies with the thickness as shown in the picture. Hi please do post ragi flour brand name. Hi Ranjana, I use homemade ragi flour. If happened to buy a store bought one, I go for "Sakthi-Ragi Flour"